When autumn colors are changing the landscape all around you to oranges, yellows and reds, won't it be fun to "go green" with a fall garden? Planting new garden greens - salad vegetables - is a tasty, terrific way to wrap up your garden season. Start in mid-August, and by late September, you'll have some nice-looking, good-eating fall crops to enjoy. Planting a fall garden is a recycling project as well. You can use the same space where you planted spring and summer garden plants. Just as your cucumber, tomato and other summer vegetables are finishing production, it's the perfect time to pull out and discard spent plants. Fortunately, most salad greens don't have very deep roots. So you don't have to dig down 18 inches or anything like that. Just make sure the soil is loose about six inches deep. Work about two inches of compost into the soil with a spade or trowel. Then plant seeds and starts of greens that take from 40 to 60 days to grow to harvest. Most of these are best grown from seed, but read the seed packets to see how to plant each variety, and to make sure production takes 60 days or less so that you have time for harvest. The main thing to remember about these veggies is to keep them evenly moist, but not drenched with water, so a watering can or hose attachment that sprinkles might be in order. Sprinkle daily or even twice daily 'til seeds have sprouted, and then daily or every other day if it doesn't rain. If it gets hot right after you plant the seeds, it's OK to cover your seedbed with a sheet or cardboard; seeds don't need light but they do need a constantly moist environment. Once the seedlings are up, these plants also need at least a half day of sunlight. Keep your seed packets so you can check how far apart seedlings are supposed to be so that the plants will grow well. 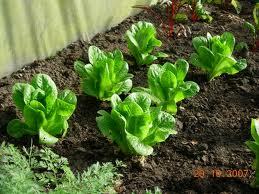 You will have to do a lot of thinning because these salad plants need air around them and good spacing. Thin by either cutting away excess seedlings at the soil line with manicuring scissors so that you don't disturb the roots of the plants you're keeping . . . or pull seedlings out and eat the baby leaves whenever possible. The best time of the day to harvest salad veggies is in the early morning, when the leaves are fullest with water. Simply pinch off spinach leaves and pull out whole radishes, beets, and other root crops. With lettuce or other plants that grow from a "crown" above the roots, you can pull out the whole plant and cut off and discard the roots, or, better yet, use scissors or a sharp knife (with adult supervision!) to cut off clumps an inch above the soil line; new leaves will re-grow and you'll enjoy a second round of salad in a few weeks! If the weather report calls for a frost and you still have a lot of salad greens in the soil, don't despair. Run outside and cover them with a sheet, blanket, box or a piece of cardboard. Then remove the cover the next day when it warms up above freezing. Many of these cool-weather greens actually like cooler nights and grow better in the fall. It is not unusual for spinach to go dormant over the coldest months of the winter and then re-grow in the spring.